Oh yes, I did. The other day I was thinking about how I could up the ante on the Halloween treat game and this gem slapped me in the face. Now, there wasn’t a recipe that I could find online and admittedly, I didn’t really search too hard. And by too hard, I mean really at all. In addition to my normal inability to care, I am now just a bit tired on the usual and there is not a lot of effort exerted in these parts. 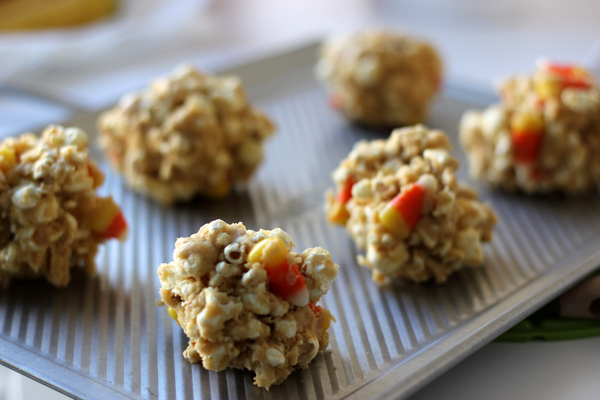 However, a popcorn cookie with candy corn is particularly genius, if I do say so myself. 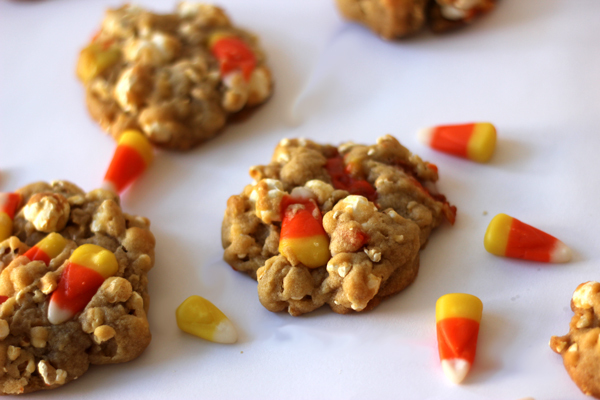 Popcorn Candy Corn cookie, meet my readers. 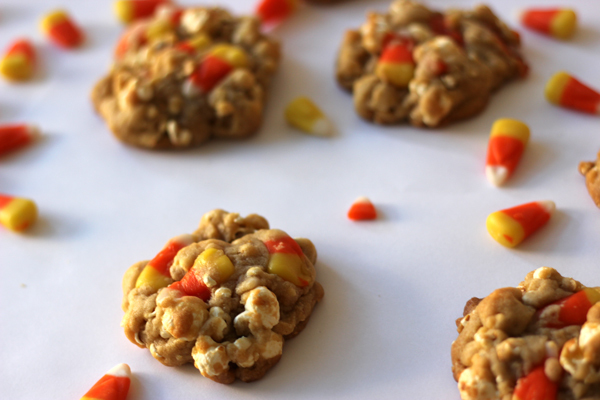 Readers, meet the Popcorn Candy Corn Cookie. Did I mention that I don’t even like candy corn? Because I don’t really. I can eat a whole bag, but then I sort of wish I could go vomit. It’s super tasty wax and I’m not sure why the hell I’m eating it. I don’t know for certain if everyone feels the same, but I would guess it is the case. It’s a weird candy to be eaten alone, but you know what’s not weird? Putting it in a cookie. That is divine. Look at those little balls of art. That’s what I’m calling them henceforth. Anyway, this recipe did not go off without a hitch. You see, since candy corn is basically not real, it melts like a mo fo. So, I highly suggest you chilling the shiznit out of the batter (without the popcorn in it) before adding the candy corn. Otherwise you will have what looks to be a candy corn crime scene on your hands. Preheat oven to 350º. To make your popcorn follow these directions. In a bowl, of whichever size you prefer, combine sugars, egg, butter and vanilla until well mixed. In a separate bowl, mix dry ingredients. This is where you’ll want to refrigerate the dough for a long, long time. Like three hours to overnight,got it? Once chilled, fold the popcorn into the cooled batter. You’ll need to put some effort into mixing it and it will look weird but don’t worry, it’s going to be okay. Okay? Add in the candy corn. Scoop a tablespoon sized mound and roll it into a ball. Once you do this, put it on your baking sheet. Make sure that no candy corn touches the baking sheet or you’ll have yourself a candy corn crime scene. I could fit six on mine with about 2″ in between. Bake em for 10-12 minutes or until golden on the edges. Let cool on the sheets to let firm before shoveling them into your cookie hole. i feel the same way about candy corn. it’s a love/hate relationship. but i can’t imagine a fall without those little guys. Whatttttt! I LOVE candy corn. Any recipe with candy corn in it is golden in my book 🙂 I am so excited to try this! Thanks for this amazing recipe! I really dislike candy corn, but my roommate is OBSESSED with it–as in, eat a bag a day, obsessed. She would LOVE these! Can’t waitttt to try this little babies out. I would never think of pairing the two together, but YUM!